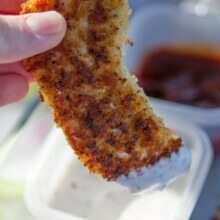 Breaded Chicken Tenders with Buttermilk Ranch Dressing is crispy, easy and delicious! The trifecta of a good chicken recipe! Preheat oven to 400 degrees. Set wire cooling rack over a large rimmed baking sheet. Spray rack with nonstick cooking spray and set aside. In a small shallow bowl, whisk together the bread crumbs, garlic powder, onion powder, salt, pepper and parmesan. In another small bowl, beat the egg whites. Dredge each tender first in the egg whites, then in the bread crumbs, pressing to coat. Put the coated tenders on a plate as you go, repeating the dredging process until all the tenders are coated. In a 12-inch nonstick skillet, heat 2 teaspoons of olive oil over medium high heat. Add ha;f the tenders and cook until golden brown on one side, about 3 minutes. Flip and cook until the second side is golden brown, another 3 minutes more. Transfer to the prepared baking sheet. Add the remaining 2 teaspoons of oil to the pan, and repeat the cooking process with the remaining tenders. Bake until the tenders are golden brown and cooked through, 8-10 minutes. For the ranch dressing, whisk together the mayonnaise, sour cream, buttermilk, dill, vinegar, garlic powder, salt and pepper.